Please contact owner Marie at 301-845-zero eight zero four. Boat is located in Walkersville, Maryland. 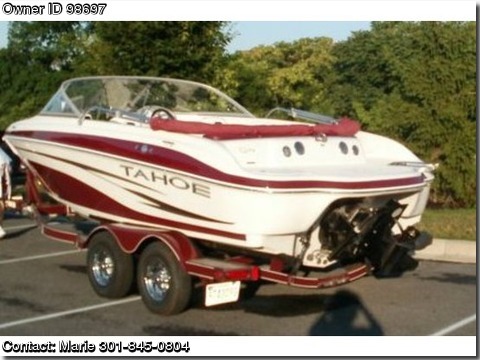 2008 Tahoe Q7 SF,5.0 MPI 260HP V-8 Alpha ECT (aprox 150 hours)Custom Trailer for Tahoe Boats with cover INCLUDED W/Sale: Ropes / Tubes (2) / skis / life jackets (10) and knee board.SPECIFICATIONS-Fuel capacity 35 Gallons Approx package weight 3631 Lbs Max person capacity 9 Persons.